Post Pictures on Instagram from Computer. 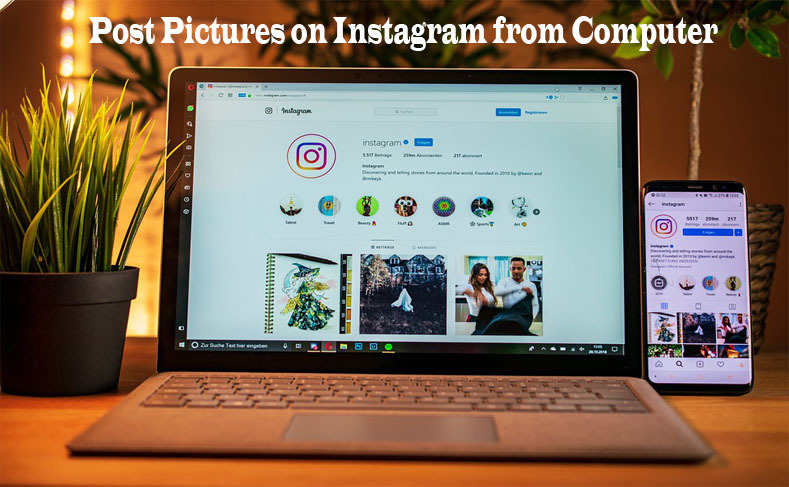 People are looking for an easy and simple way to post pictures on the Instagram platform. Well, you can Post Pictures on Instagram from Computer because it is easier. When you post pictures on Instagram from computer, it does not take long for the picture to be posted, unlike the mobile device. When you post pictures on Instagram from a computer, it enables you to edit the picture and filter it, also makes you add some effect to it, to make the picture look more beautiful. Their lots of features you enjoy when you use the computer to post pictures. And on this article, I will be telling you on how you can post pictures on Instagram from a computer. But before I continue, I will like to tell you what instagram is and what it is all about. Instagram is a social media site that people use to share photos, stories and video with friends around the world. In other words you can post anything on instagram and it will be viewed by people around the globe. This platform was created by two men and they are Kevin Systrom and Mike Krieger. And it was launched in the year 2010 October. This instagram app allows you as a user to upload photos and video on the platform, And in doing that you can also edit the content with filters. And this platform was created to enable brands, celebrities and other organizations to reach their fans and customers out there. There are lots of activities you can do on the instagram platform. I am going to show you how you can post pictures on instagram from your computer. It is less difficult and stressful. But you will need to follow some tips that will be listed below if you want to post pictures on instagram. On your chrome, open an incognito window. Then tap on the three dots icon at the top of your screen. Now select the developer tools. After that click on the mobile icon at the top of the screen. You can now login to instagram. Tap on the + icon below your screen. Your files on your computer will be displayed. You will now choose the photo you wish to post. After that select a filter on the picture. Tap next located at the top of the screen. You will now fill in the description for your picture. Then tap on share, it is a blue button located at the top of the screen. Then your picture will be posted on Instagram for your friends to view it. There are lots of benefits you enjoy when you post pictures on instagram. I will list some benefits out for you to see. It gets you more followers on instagram. Also it can make you gain more likes. And can also make you gets famous on the instagram platform. It also makes people to identify you on the instagram platform. These are some benefits you can enjoy when you post pictures on instagram, although there are much more.